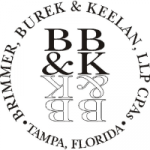 Founded in Tampa, in 1961, Brimmer, Burek & Keelan LLP is a full service accounting firm with multiple QuickBooks Certified Advisors. They provide tax services including income and estate tax planning, taxpayer representation, and tax return preparation. They also offer consulting in profitability enhancement as well as specialty consulting in business process and operations. Work For Brimmer, Burek & Keelan, LLP? Claim This Page.